A young black rhinoceros shows its hooked lip. 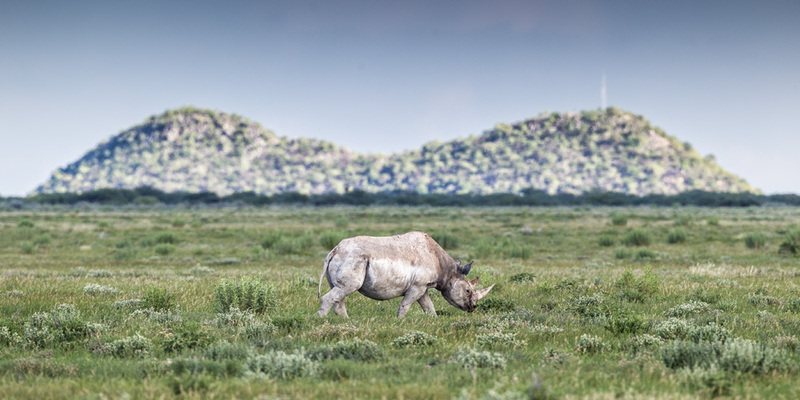 It is probably the first question that comes to your mind when you see a rhinoceros in Etosha: Black or White? It’s actually very easy to tell the two apart. They are physically very different, but if that’s not enough then look at their lips. The white rhino is primarily a grazer and has wide (or square) lips. 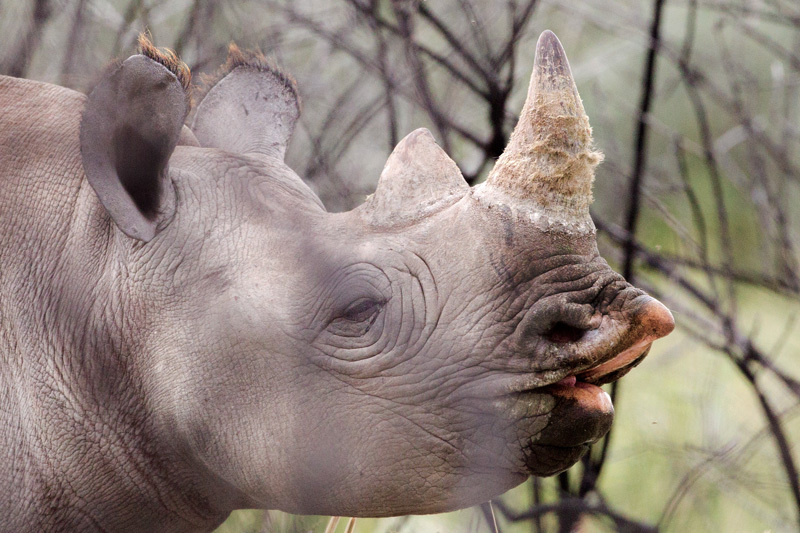 The black rhino is a browser and has a prehensile hooked lip (see photograph). If you try looking for a difference in color, as their common names suggest, then you might as well call them both grey rhinos. Or white, as all rhinos tend to be in these parts thanks to Etosha’s abundance of white dust. I’ve never seen a white rhino in all my years in the Etosha National Park. They are here, apparently. It’s an introduced species here and their historical range was mostly restricted to (the country of) South Africa. Black rhinos, on the other hand, were more widespread of the two rhino species in the continent. This is black rhino country. For how long, I do not know, as the evil brewing in the east threatens their very existence. Regardless, the chances of seeing a black rhino are higher than seeing a white rhino in Etosha. Now that you’ve successfully identified your rhino as black or white, inquisitiveness takes you a step further. Why are they called black or white when there’s no difference in coloration? That’s a much debated question with no clear answers. The black rhinoceros was the first of the African rhinoceroses to be discovered by European science. They promptly called it ’bicornis’ (two-horned) to differentiate from the Indian rhino (unicornis), which was well known by that time. Only half a century later was the white rhinoceros made known to science, when a famous explorer (Burchell ) shot two animals in South Africa and published his finding in a scientific journal. He called it Rhinoceros simus – meaning flat-nosed rhinoceros, perhaps as its single most differentiating factor from other known rhinos: Indian or one-horned rhino and the two-horned African rhinoceros (black rhinoceros). In the following fifty years, the scientific names had given way to their common names that is in use today. In James Chapman’s 1868 book ‘Travels in the Interior of South Africa’, he refers to the southern African rhinos as black or white. What happened in the years after Burchell’s discovery that led to the African rhinos being called black or white is one great mystery. There are many theories regarding the naming of the white rhinoceros, from the ridiculous ones to the plausible ones. A paper published in 2003 (Rookmaaker ) lists the possibilities. However, nobody really knows for sure. In all probability, the white rhino got its common name first, perhaps as a corruption or translation error? And if that is true, then the black rhinoceros got its name because black is opposite of white? Or did the black rhino get its common name first, and white was just an alternative name? Well, I’d like to know if you have an answer! Rookmaaker, Kees. “Why the name of the white rhinoceros is not appropriate.” IUCN (2003): 88.